I’ve played as a wizard in just about every RPG I’ve ever played. Something about being able to rely on yourself, on one’s own energy and power, rather than souped-up gear is highly appealing to me. This is why I was so psyched to see that Ziggurat is all about playing as a wizard, even if it’s less in a traditional RPG type of way and more in a first-person, shoot-em-up type of way. Ziggurat takes place in a visually beautiful, procedurally generated tower, meaning each time someone decides to try to playthrough the game that person will get a completely different experience than the time before. Everything from the map, to the types of enemies, to the weapons that can be found are all varied in each playthrough. The only thing that players have any type of control over is who they want to play as. There are a number of different characters to choose from, although they need to be unlocked by completing certain objectives. Some characters can only be unlocked by defeating a certain number of enemies, while others can be unlocked by reaching a certain level in a single playthrough. Each character has his or her own strengths and weaknesses, such as being able to cast one type of spell better than being able to cast another type of spell. There are a total of four different spell types — wands, books, staves, and alchemy. Each type uses a different type of mana to cast, and while the wand is a starting weapon that cannot be changed, the other spell types must be found and equipped. Unlike in typical RPGs, casting spells in Ziggurat is more like firing a gun than anything else. The wand acts as a sort of machine gun/shotgun, as each spell has two firing types, and other spells might act as grenades or snipers. It’s fast-paced, and the game has more in common with, say, Borderlands than it does with an RPG that you might expect a wizard to be a playable character in. The tower is split up into levels, with the player always starting on the first level. To get to a new level with more difficult enemies, the player must find a key and then head on over to the boss room, where, if the boss is beaten, the player may go onto a higher level in the tower. While trying to find the key or the boss room, players will have to enter a lot of rooms that contain a lot of monsters. There are quite a few monster types in Ziggurat, and none of them are very easy to defeat. Room that contain monsters — they are called minions in the game — are impossible to leave until all the monsters are defeated. While this puts the player in a tricky situation, it also ensures that the player will kill a whole bunch of minions and pick up a whole bunch of experience points. Experience points, of course, lead to leveling up, and various improvements to health, speed, mana, and more can be made upon gaining a new level. Besides rooms filled with minions, there are several other room types. Some rooms are filled with traps, all of which guard a treasure chest. 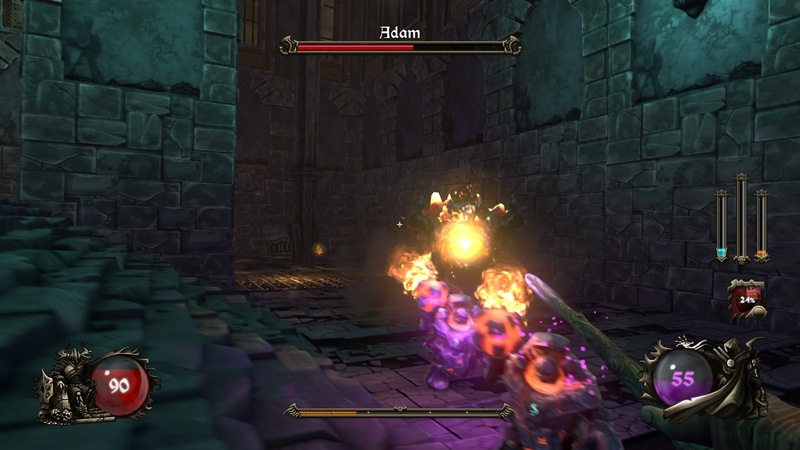 Some rooms contain statues that will either grant the player a bonus, such as unlimited mana for a certain amount of time, or a penalty, such as taking away a spell. And still other rooms simply contain burning hot lava or spikes that shoot out of the walls, just as a way to make it very difficult for the player to make his or her way to another room. I died a lot in the rooms with the treasure chests, mostly because I got too greedy and tried to hurriedly make my way over to the glowing chests, only to accidentally step on floor spikes or hot embers. While dying isn’t all that fun, it is to be expected in Ziggurat. The game wants players to die again and again and again, which is why the randomly generated levels are such a positive thing. After dying, players usually unlock news spells or level up perks that can be found or chosen in the next tower, which gives some incentive to immediately jump right back in there and try again. However, despite unlocking a few things after almost every death, I felt that some of the things I was really looking forward to unlocking, like new characters or new enemies, were almost impossible to unlock. Or, at least, they take a long, long time to get. This was somewhat disappointing to me, as I felt that I should be able to change my character just as frequently as the map changed around. The other thing that left me feeling slightly disappointed is the lack of multiplayer in Ziggurat. While I don’t normally see this as a bad thing, Ziggurat is the type of game that is just begging for some co-op capabilities. Shooting up hordes of minions is fun alone, but it would be so much more fun if I could do that with a friend or two. Still, for only $15, Ziggurat is a pretty amazing game. It looks beautiful, offers a great deal of replay value, and features wizards in a badass way. There are a large number of spells and upgrades to choose from, and each playthrough literally brings new and exciting features into the game. If you haven’t already downloaded Ziggurat, you probably should think about doing so. Review copy bought by reviewer. For information on scoring, please read our Review Policy here.